In the frenzy every moment is precious. There are so few opportunities to do... well -- anything other than getting parents and children fed and in bed. Still, every once in awhile we get to spend a few minutes being proactive about making our food healthier and more environmentally friendly. We've always been inclined to make food rather than buy prepared food. And when I'm ambitious, I like to preserve food in various forms. One of the easiest things to do when it comes to food preservation is to ferment vegetables. With a small investment of time you can get something that is healthier than anything you would buy in the grocery store. It also tastes much better than the food you pull off the grocery shelves. Perhaps the best example of this is sauerkraut. 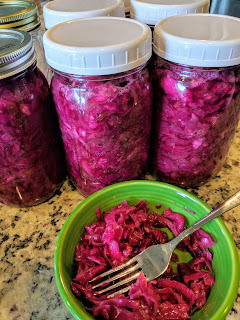 Something about cabbage makes it just an easy vegetable to start fermenting. I also don't feel like you need to complicate it. If you look for recipes online there will often be a fancy take on sauerkraut that adds saffron threads and caviar. They have to do something to differentiate from the other online recipe with chocolate and rhubarb. But I'm not going to put this on crackers to impress my friends at a champagne brunch. It is an ingredient in quickly thrown together meals. The key here is -- it's an ingredient. Make it simple and it won't take hours of prep or running all over town. You need two things. Sea salt and cabbage. That's it. I use sea salt because I've read that the iodine in table salt can interfere with the fermentation process. But I'm sure people have gotten away with using table salt as well. I just haven't tried it. 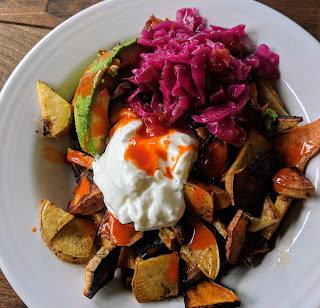 The only fanciness I allow myself in this recipe is to mix green and purple cabbage to make a amazing purple sauerkraut that looks nothing like the Heinz jar next to the relish in the grocery aisle. 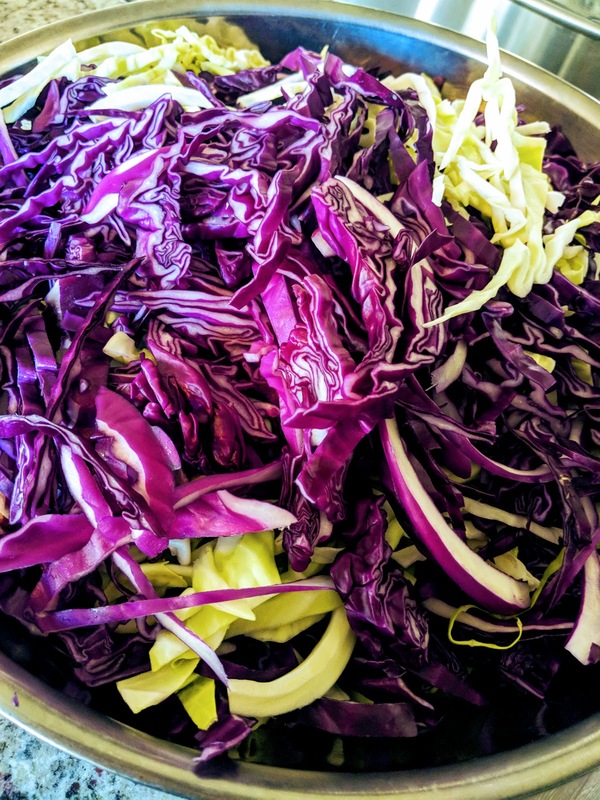 All you need to do is take a knife and quarter and core the cabbages. Then chop them up into something that looks like coleslaw. Throw it into a bowl with the salt. I put in 1/2 a tablespoon of salt per head of cabbage and then squeeze the cabbage and salt together to start extracting the liquid from the cabbage. This is where you get to take out the frustration of your child asking you "Why?" 15 times in a row as you patiently try to explain to them that toddlers and sharp knives don't mix. I taste the mixture and add more salt to taste. You don't want it to be too salty so it's best to creep up on it slowly. 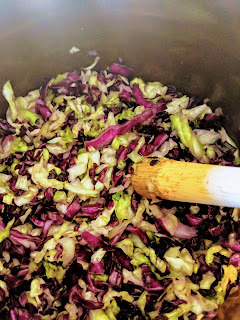 Usually I'll stop around 1 tablespoon per head of cabbage, but this depends on the cabbage. 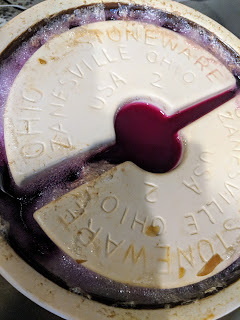 After squeezing everything together to the point where everything looks bruised a bit, let is sit for 10 to 15 minutes and you'll be surprised how much liquid is in the bottom of the bowl. Pack that into a crock or a jar tightly and put a weight on it. I shove it into the crock using a muddler for making mojitos. 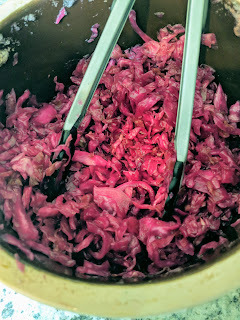 Pour the liquid from the bowl onto the sauerkraut. If the liquid does not cover the cabbage, don't worry the weight will keep extracting liquid. Check back in a few hours. I've never needed to add water, but if you still don't have enough liquid after letting it sit overnight and you are certain that you squeezed it like it was a stress ball during finals week, then go ahead and top it off with water. Leave it on the counter at room temperature for 3 to 7 days. Taste it each day after day 3 and if you like it, put it in the fridge. If you want it more sour, the keep it on the counter. When you're done with it, use it on anything involving potatoes. 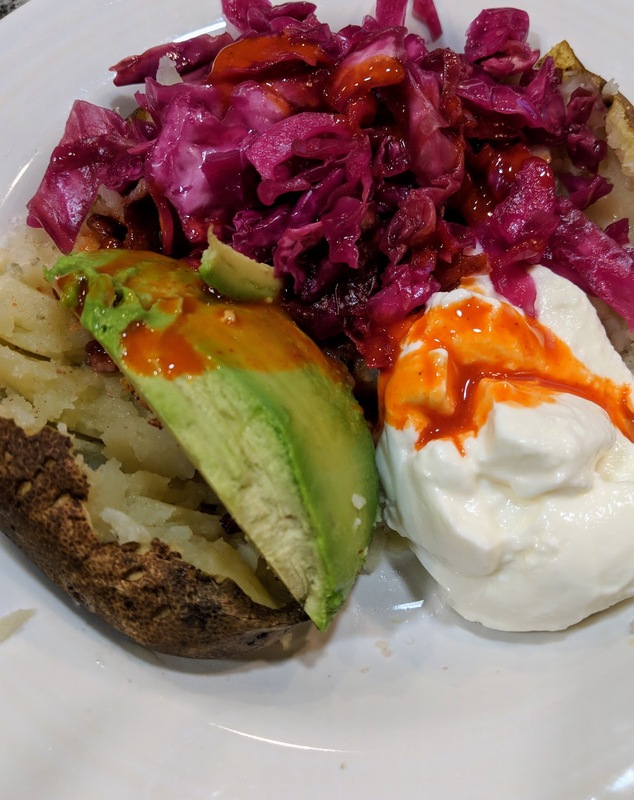 Baked potatoes are great with this type of sauerkraut. Throw it on hash browns or cubed potatoes. Put it in tacos. Add it to red beans and rice. This isn't the type of sauerkraut that can only be used on Reuben sandwiches and hot dogs. This is something much better. And because you made it yourself, there are no preservatives other than the salt. It's probiotic. And there is no empty jar from the store to recycle at the end.